Gerard David was born in the Netherlands. The young painter studied under accomplished artist Albert van Oudewater. He became one of the most important Northern Renaissance painter working in Bruges in the 15th Century. 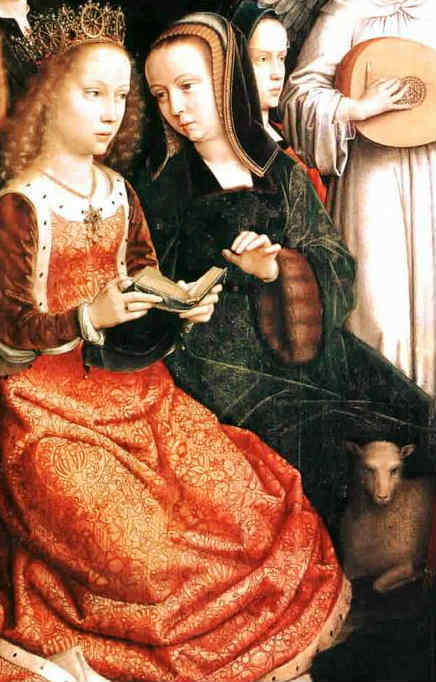 Like many painters of his time Gerard David signed very few paintings. Author Ernest Gilliat-Smith asserts "From the little that is recorded of him he seems to have been a devout and charitable man, and the placid scenes he delighted to paint indicate that he was naturally of a humane and gentle disposition. We know that in 1508 he joined the brotherhood of Our Lady of the Dry Tree, a famous religious guild affiliated to the Franciscan order. The following year he presented to the Carmelite nuns of Bruges one of his most exquisite pictures, an altar-piece representing Our Lady surrounded by virgin saints, at present in the gallery at Rouen; and later on, when the same nuns were in straitened circumstances, he advanced them a very considerable sum free of interest, only stipulating that the money should be returned when he asked for it. This he did during his last illness, several years afterwards, and it is pleasing to find that the nuns at once complied with his request. But to return to the days of his aberration. Shortly after the execution of Peter Lanchals and other members of the magistracy of Bruges, who like him had been accused of corruption and of conspiring with Maximilian to deprive the town of its liberty, the new magistrates whom the people had chosen to fill their place commissioned Gerard David to paint for the Court of Justice in the Hôtel de Ville two pictures which should remind the judges that if they should at any time fail in their duty punishment would assuredly follow." Ernest Gilliat-Smith further states "Gerard was a native of Oudewater in Holland, who some four years previously had taken up his abode in Bruges. On the 14th of January 1484 he was enrolled among the members of the Guild of Saint Luke. He was probably an ardent patriot, at all events was in touch with the popular leaders, for we know from documentary evidence that they employed him to paint the iron gratings which were placed before the windows of Jean de Gros’s mansion when Maximilian was imprisoned there, and, as we have seen, it was he whom they commissioned to paint the panels for the Town Hall. The theme selected for his pictures is a horrible one—the conviction and the flaying alive of Sisamnes, an Egyptian judge who had been accused of receiving bribes. The story is first told by Herodotus, but David had probably culled it from the pages of Valerius Maximus, and there can be no doubt that the subject was suggested to him by the tragedy which had just taken place beneath the shadow of the Belfry. He has represented himself in the first panel calmly surveying the arrest of Sisamnes, and it may well be that he actually witnessed the execution of Lanchals, perhaps expressly with a view to these paintings. In each case the scene is laid at Bruges, the figures, the faces, the attitudes, the costumes, are all essentially Flemish, and it is in the highest degree probable that he introduced other portraits besides his own."